Describing the Congress government in Karnataka as non-performing, corrupt and defunct, BJP president Amit Shah Saturday called upon the people to free the state from the ruling party. "As the NDA freed the country from the Congress at the centre, the people should free the state from the ruling party. 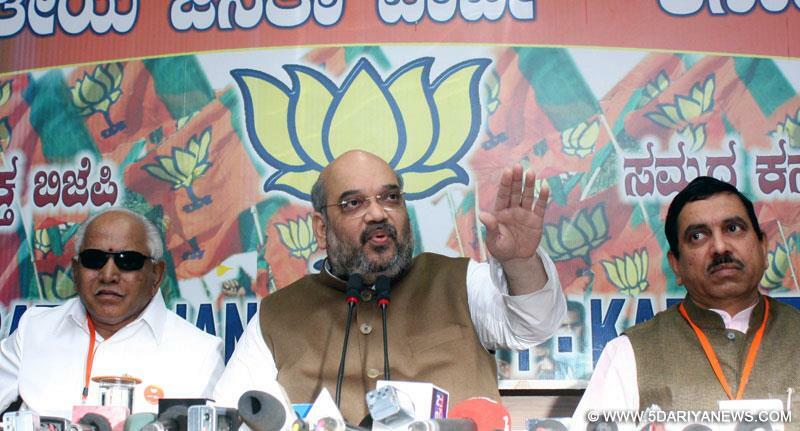 By joining hands with our party, the people should ensure a Congress-free Karnataka," Shah told reporters here.In his maiden press conference in the city during his second visit to the state, Shah alleged that the state's economy had been crippled under the Congress misrule and the state's growth rate had declined to five percent from 10 percent during the previous BJP rule. "The youth of Karnataka have become unemployed after the Congress came to power and the condition of farmers is very poor, with 77 percent agricultural households indebted," Shah asserted. The Congress returned to power in the state after a decade by securing a majority (122) in the 225-member House in the May 2013 legislative assembly elections, defeating the BJP which ruled the state for the first time on its own since May 2008.Claiming that the Congress government in the state had proved to be an abysmal failure in governance and in maintaining law and order, the Bharatiya Janata Party president said the people's mandate was being squandered by failing to inclusively represent the cause of the millions of people across the state. "Instead of governing the state, the Congress government has been indulging in sectarian populism, by introducing the Karnataka Religious Institutions and Charitable Endowments (amendment) bill in the state assembly during the recent (Dec 9-20) winter session of the state legislature at Belagavi though subsequently the chief minister (Siddaramaiah) had announced that the contentious bill would be withdrawn in the ensuing budget session due to our stiff opposition," Shah pointed out.The state government had also hurriedly withdrawn the Karnataka Prevention of Cow Slaughter and Protection Bill of 2010 and its amended 2012 version, which was awaiting the President's assent, on the last day of the winter session after the opposition BJP protested against the sectarian agenda of the Congress.